Top PAC runners at the Oundle 20. From the left they are Daniella Hart, Kirk Brawn and James Whitehead. It was no surprise to see Phil Martin leading the club home with a convincing win at the sharp end . He clocked 1:58.14 and was 90 seconds clear of his nearest rival, Alex Metcalfe from Ely. But the growing depth of the club was highlighted as well as the club took the senior men’s team prize. James Whitehead is proving successful at moving up through the distances and his 2:02.29 for third pace showed his endurance over longer races is developing well. 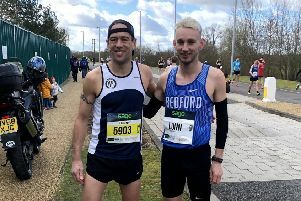 Two weeks after running the Essex 20, Kirk Brawn was once again posting a strong performance over this distance and a fifth place in 2:03.17 was further proof of his current fitness. Oli Mason clocked 2:13.23 for 13th place and is an athlete now growing in confidence by the week. 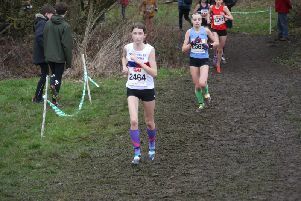 Daniella Hart has thrived since she joined Peterborough AC’s endurance group at the end of last summer and second place in the women’s race in 2:21.36 once again demonstrated the level she is now consistently running at. Hart’s training partner Kayleigh Draper, who also trains with the Peterborough AC group as a second claim/track member took five minutes off her PB for the distance in her Yaxley vest as she came in as sixth woman in 2:32.24. And another of the Peterborough AC endurance squad defying the wind to take another chunk out of her lifetime best was Alison Dunphy. The Eye athlete was home in 2:47.18 for a PB by over four minutes. She was just ahead of another athlete from the group - fellow Eye athlete Nick Wilkins - who was home in 2:47.21. Ladies - 8 Kerry Balmer (Yaxley) 2:36.52; 9 Gina Crane (Yaxley) 2:37.02; 10 Louise Alexander (Yaxley) 2:37.37. Men - 10 Jeff Lucas (Werrington) 2:11.45; 17 Mike Chapman (Nene Valley) 2:14.43; 30 James Mcdonald (Nene Valley) 2:23.06; 32 Andy Todd (Nene Valley) 2:24.09.